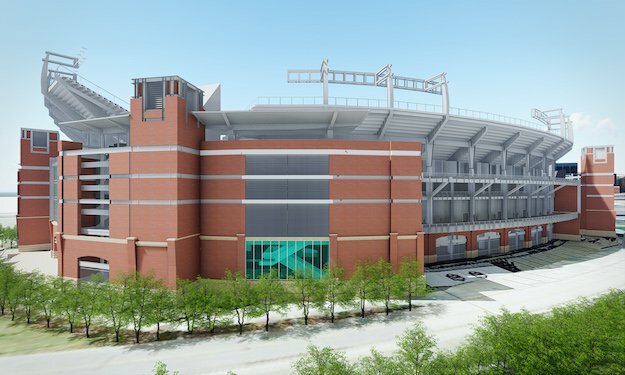 Plans were announced today by the Ravens and Maryland Stadium Authority (MSA) detailing a $144 million investment in M&T Bank Stadium. The improvements will be implemented over the next three years with $120 million in funding provided by the Baltimore Ravens and $24 million by MSA. The stadium is owned by MSA. The Ravens described this as “demonstrating a continued commitment to create an exceptional gameday atmosphere.” The improvements include new 4K ultra-high definition video displays replacing the current displays above the end zones in the lower deck; four new, two-story luxury suites in the corner “notches” of the upper deck with new video board above them; a second LED ribbon board above the club level; two new escalators and elevators to the upper deck; a new sound system; and upgraded kitchen facilities. The new suites will bring the total at M&T Bank Stadium to 130. 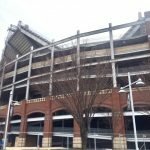 Ravens Senior Vice President of Stadium Operations Roy Sommerhof said they will be about twice the size of the stadium’s existing suites and noted that the current suites at M&T Bank Stadium have been sold out. The new upper deck video boards will feature scores from other games around the NFL as well as fantasy stats. 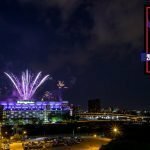 Sommerhof noted that the back of the new video boards facing the city will likely be lit in different colors, matching what is currently done on the back of the upper deck. The back of the upper deck is usually lit purple, but changes colors for certain holidays and events. “We maintain the goal of providing consistent satisfaction for everyone who attends Ravens games and other events we host,” said Sommerhof. “We believe this is an important investment that will continue to make our venue one of the NFL’s best. The plans were designed by Populous and the general contractor will be Gilban Building Company. M&T Bank Stadium was recently named the top NFL stadium experience by Stadium Journey. M&T Bank Stadium originally cost $220 million to build when it opened 19 seasons ago in 1998. 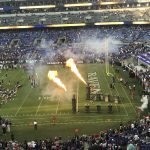 Since then, the Ravens have spent approximately $100 million on past enhancements, including a $45 million investment from 2013-15 to install Wi-Fi capabilities, advanced LED video displays, redesigned concession stands, and upgraded concourses. 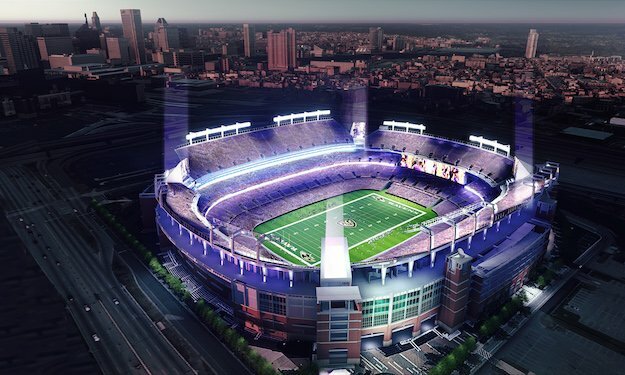 After this next round of renovations, the Ravens will have about matched the state’s investment into the stadium. Cass noted that the cost of new stadiums in recent years has been well over a billion dollars with the Rams new Los Angeles stadium expected to cost more than $2 billion. Video Displays: Two dramatic, 4K ultra-high definition video displays, which will double the width of the stadium’s current standard HD boards, will remain positioned behind each end zone below the upper level. These new boards, measuring approximately 200 feet wide and 36 feet high, will equal the highest resolution and clearest picture of any stadium video display in the United States. 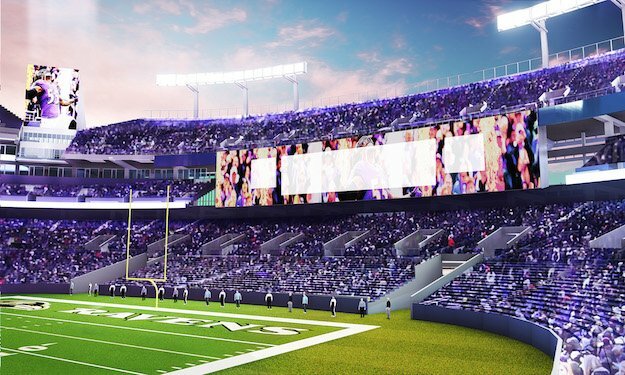 To fully enhance the in-stadium video production, the Ravens will also expand the audio/video control room and install 4K cameras, lenses and control equipment. The Ravens have invested in 11 manned cameras and additional robotic cameras, which will provide fans with more angles of live action, statistics and replays than ever before. Another improvement will be the addition of new LED ribbon displays, which will be installed around the seating bowl’s suite level. 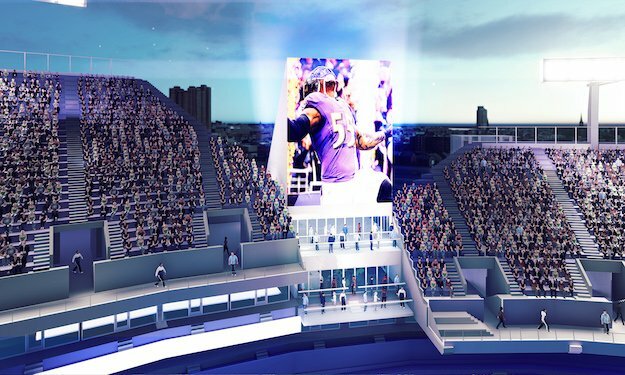 In total, the Ravens will be installing more than 28,000 square feet of video displays. 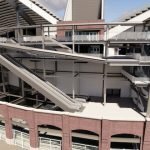 Escalators and Elevators: Escalators and elevators to the 500 level will be installed to improve crowd flow and ensure convenience for fans accessing seats in the stadium’s upper level. “Corner Notch” Suites & Video Boards: New suites will be built into each open notch of the stadium’s upper bowl. Large 4K ultra-high definition video boards, measuring approximately 33 feet wide and 44 feet high, will also be installed atop each of the four suites, providing fans with additional in-game content, NFL highlights/scores, statistics and fantasy information. Club Level: All concession stands, restrooms and bar/lounge areas on the stadium’s club level will receive upgrades. These developments will enhance the area’s general design/comfort, audio/video capabilities, quality of service and food options. Improved Kitchen Facilities: The stadium will undergo kitchen renovations and have an additional kitchen built, improving the quality of food and providing more options at concession stands throughout the entire venue. Sound System: A new sound system in the seating bowl will be installed.